A lot of authors had been wondering how to market your books out there without shamelessly promoting yourself and ACTUALLY getting in results. There had been so many books about "How To Write A Novel" but only a few books tackle "How To Market My Novel". 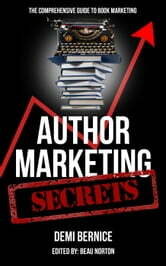 Thus, Author Marketing Secrets is handing you a Comprehensive Guide To Book Marketing. The basics of marketing is present in the book and it's embellished with a number of secrets to unfold. This book is best for authors looking for books about book marketing or books about marketing tips and secrets and how to upgrade and take your marketing game to the next level!